Made up of former members of the NorthEnd FC and new players from the weekly Kickarounds, this team played recreational soccer in the Columbus Co-Ed Soccer League. In the summer of 2001, Trisha Seiler, Stephanie Morgan, Tony Contakis, and several other key individuals decided to re-organize the NESC team to again play their unique style of soccer around central Ohio. 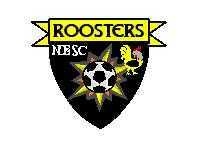 The team has since evolved into the NESC Roosters (see below). Soccer is not the only sport members of the NorthEnd Social Club play...we also love volleyball! 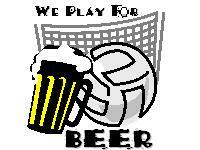 This group of fun-loving, beer-drinking volleyballers play on Sunday nights at Flannagan's in Dublin. Some of our more hard-core soccer members have joined a team known as the Vitesse Football Club. This group plays in the Columbus Premier Soccer League at SoccerFirst in Dublin. It is managed by our very own John Rohrbacher. 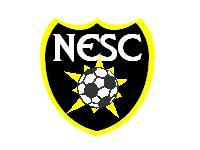 The current edition of soccer for the NorthEnd Social Club family is our NESC Roosters team. When the NESC found a sponsor - Rooster's - the group decided to add "Roosters" as the team's secondary name. Stephanie Morgan and Trisha Seiler have done outstanding jobs managing both the indoor and outdoor teams, maintaining this valuable sponsorship with Roosters. Their time and efforts finally paid off as the outdoor squad has found some winning success and the indoor team experienced its first outright championship. Some of the former members of the NorthEnd created a team that would play in more competitive matches against higher quality opponents. They are known as the Hunt Park Rangers. Oddly, this co-ed group plays in the same leagues as the NESC Roosters in around the Columbus area. The only difference - the division and skill level of the players. HPR is managed by Rich Fidler. He has done a great job sharing players with those on the NESC roster, and continues to play for the Roosters as well.